A STUNNING QUEENSLANDER WITH A WARM HEART! Surrounded by quality character homes and in true walking distance to practically everything, this stunning residence retains much of the charm of its character facade and is guaranteed to astonish with its grand open spaces and immaculate finishes. Fresh from an extensive $450,000+ renovation and extension, every fine detail has been carefully restored. With a total of approximately 292sqm (31.4 squares) of living, this magnificent house provides a huge area for family living and a sumptuous lifestyle. Set on a 885sqm north facing block and framed by immaculately presented gardens, this remarkable home is a triumphant collaboration of contempory design and quality craftsmanship. The garden boasts an arbor and mature trees surrounded by manicured hedges creating a sophisticated, private and tranquil oasis. Housing four above average sized bedrooms, the main level is spacious and beautifully appointed. 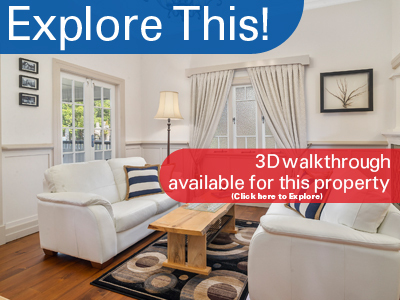 Featuring soaring ceilings, hoop pine timber floors, air conditioning and with three of the bedrooms assessing their own walk-in-robe (fourth has generous built-in robe), the layout will suit a variety of families. The master bedroom has a feature bay window and ensuite with (separate toilet), whilst the main bathroom has a spa bath as well as double shower including rain shower-head. The kitchen adjoins the breakfast room and outdoor deck creating a wonderfully integrated living space. Boasting stone bench tops, commercial grade oven, centre island bench, an abundance of soft close drawers and butler's pantry, the kitchen is immaculately appointed and easily services the outdoor entertaining space. There is also a main lounge/ dining area for formal entertaining. A media room/rumpus (wired for 7.2 surround sound and projector) offers further space for families, while the office has 2 fitted benches and is fully networked to cater for your every need. The expansive outdoor entertainer's haven is the perfect place to enjoy alfresco dining. Measuring a clear 9m x 5m, it enjoys a north-east aspect and has 11' high ceiling, 2 fans and a gas point. The garage measures a generous 7m x 6.5m and has a double auto door, 2.5m high with plenty of clearance for a 4WD. A rear roller door accesses an extra parking space for a trailer and the vegetable garden. The entire area under the home is paved and has lights and power available.